Now that the “Learn Your X” classes are finished until 2020, patrons are encouraged to bring any telescopes or binoculars to a public BRAS meeting at HRPO. (The last held meeting, on 14 January, is pictured below.) It is strongly recommended to contact BRAS or call 768-9948 beforehand, to ensure requests for assistance are limited at any particular meeting. The sky really was wonderfully clear for the Total Lunar Eclipse. 273 patrons visited. The wind chill was near or below zero, which was no big deal. An amazing and evocative view of totality was everyone’s reward. The edge of the Moon closest to the center of the Earth♁’s shadow could be distinguished easily from the edge farthest from the center—that edge was brighter. The temperature went below zero just before 1:00 am. HRPO closed then. 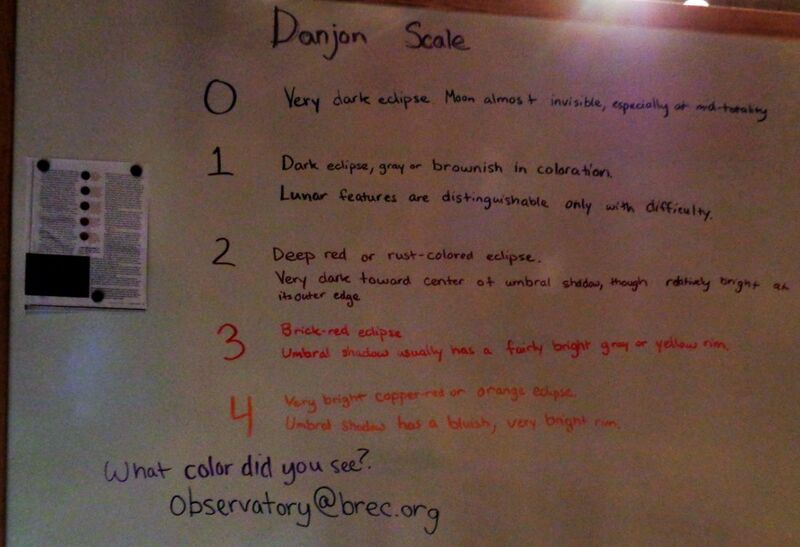 Personnel suggested patrons estimate the color of the eclipsed Moon using the Danjon Scale; the Scale was transcribed (pictured below) by Amy Brouillette. Last updated by Frederick J. Barnett on Friday, February 8, 2019, 05:52 PM.